World's largest model rocket launch covered for Discovery Canada "Daily Planet"
The world's largest model rocket headed towards space on Sat. April 25, 2009 from a farm field on Maryland's Eastern Shore. 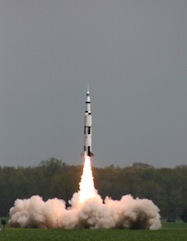 Weighing in at 1,648 pounds and more than 26 feet tall this missile is a scale replica of NASA's Saturn V rocket. It made it 4,441 feet closer to space seconds after Ohio ameteur rocketeer Steve Eves pressed the ignition button. The actual Saturn V rocket carried NASA astronauts and equipment into space for the lunar exploration program in the 1960s and 70s. Forty years before this flight a full-scale Saturn V carried the first man to step on the moon. This rocket was 10% in scale to the original and cost about Eves about $30,000. 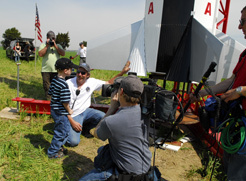 The program "Daily Planet" on Discovery Channel Canada took interest in covering the historical launch. Alt Gobo's Peter Roof ran one of two BetacamSP cameras covering all aspects of the people of gear involved in making, and the crowds witnessing, the event. Brad Fulton worked the other camera and Michael Poole was on sound.